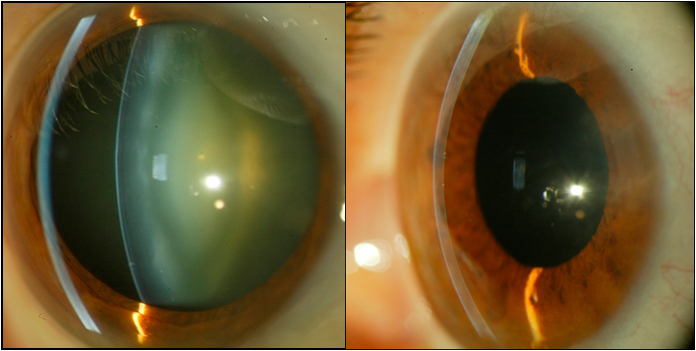 A cataract is one of the most common ocular alterations. It is defined as any opaqueness in the crystalline lens. The crystalline lens, one of the essential components of the eye's apparatus, focuses incident rays of light onto the retina and, over the years, gradually becomes less transparent. Although cataracts tend to progress slowly, both eyes normally end up being affected, resulting in glare and the partial or complete disappearance of the image. Cataracts are a pathology caused by many different factors, although the main risk factor is age. Several illnesses such as diabetes, high blood pressure and obesity, together with other external factors such as tobacco, alcohol, malnutrition or ionising radiation, among others, can be involved in their formation. Congenital and infantile cataracts due to hereditary causes or other developmental disorders. Cataracts secondary to trauma, associated with metabolic disorders or generated as a side effect of some drugs, especially corticosteroids. In spite of considerable efforts made in research, there is no pharmacological treatment to prevent or cure cataracts so that the definitive treatment is still surgery. Cataract surgery is the most frequent operation carried out in ophthalmology. The surgical technique of choice for removing cataracts is phacoemulsification, keyhole surgery that requires no stitches. Before operating, we systematically carry out a thorough ophthalmological examination with corneal topography, specular microscopy and biometry. A cataract operation is very quick and painless, effective and with a very little risk. The operation, which is carried out without hospitalisation and under local anaesthesia, consists of extracting the content of the opaque crystalline lens and replacing it with an intraocular lens of the right power to correct the associated refractive defect. There are different models of intraocular lenses depending on the eye's characteristics. Monofocal lenses are a single focus point: near or far. When the crystalline lens is replaced by a monofocal lens, distant vision improves notably and complementary glasses are prescribed for near vision. Lenses that can correct both distant and near vision are currently divided into two main types: accommodative and multifocal (bifocal/trifocal). We choose the most suitable type depending on the eye's characteristics and the visual requirements of each person, according to their preferences, activities or profession. When there is a high degree of associated astigmatism, we use special lenses that correct this, which we call toric lenses. These may be monofocal or multifocal, depending on the requirements of each particular case. After the operation, many patients notice an extraordinary improvement as the procedure improves not only the defect of the cataract but also any refractive defects the patients may have had, such as myopia or hypermetropia. At the Institut de la Màcula we carry out a personalised study of each patient. Based on the conclusions reached, we choose the intraocular lens with the greatest refractive precision for each patient in order to achieve the best possible quality of vision after the procedure.